Keep refrigerated. If freezing, freeze on day of purchase and consume within 1 month. Oven cook (From Frozen): 1. 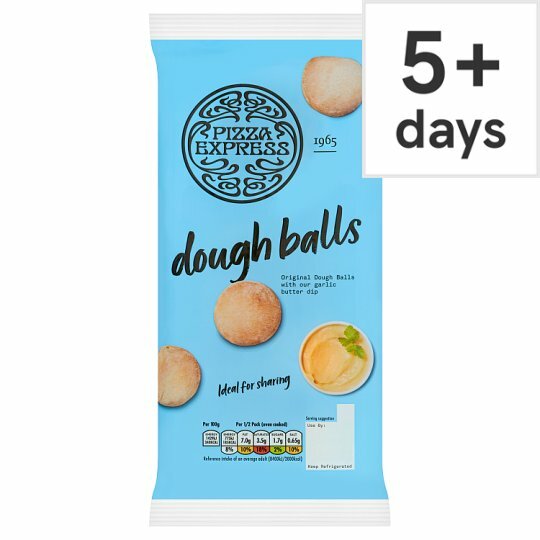 Follow instructions for chilled Dough Balls. 2. Increase baking time to 7-8 minutes. Oven cook (From Chilled): 1. Preheat oven. 2. Remove from tray and film wrap. 3. Set aside the garlic butter dip to warm to room temperature. 4. Place Dough Balls on a baking tray. 5. Bake for 5-6 minutes. 6. Once cooked, remove Dough Balls from the oven and serve immediately. While every care has been taken to ensure product information is correct, food products are constantly being reformulated, so ingredients, nutrition content, dietary and allergens may change. You should always read the product label and not rely solely on the information provided on the website. If you have any queries, or you'd like advice on any Tesco brand products, please contact Tesco Customer Services, or the product manufacturer if not a Tesco brand product. Although product information is regularly updated, Tesco is unable to accept liability for any incorrect information. This does not affect your statutory rights. This information is supplied for personal use only, and may not be reproduced in any way without the prior consent of Tesco Stores Limited nor without due acknowledgement.